I love nice surprises. Especially when they come gift-wrapped in boxes and packed with sparkles like Wicca Moon’s ritual kits. 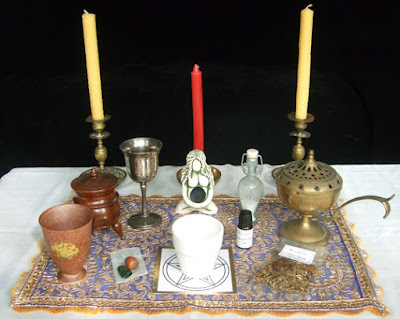 I tried out the Imbolc kit in February and recently received the one for Ostara – or the Spring Equinox. 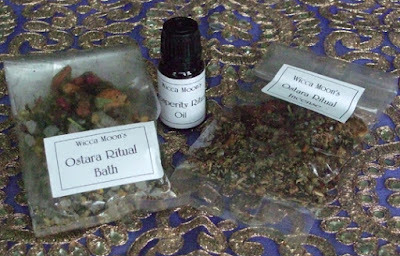 The Wicca Moon Ostara ritual kit contains lots of goodies including handmade bath salts, incense and ritual oil; two beeswax candles; a crystal; a plant pot and acorn; a gorgeous altar cloth and a lovely goddess figurine. It also includes information about seasonal traditions and a Spring Equinox rite to perform, neatly rolled up and tied in a ribbon with a bow. My favourite item is the goddess figurine. I must admit I have long wanted one like it - in fact ever since I saw one at the Wicca Moon stand at a festival one time. I'm delighted to now be a proud owner. It currently has pride of place on my altar. I always find it useful to do a run-through of any rituals before I do them for real, just to check I have everything I need. The last thing you want after casting your circle is to find you don’t have an essential ingredient for the rite! The photo at the top shows the altar I set up for my practise run. The main focus of this Ostara ceremony is to plant the acorn in the pot as a symbol of planting the seeds of your desires for the year to come. I think it is a lovely way to celebrate the time of year when we are looking forward to brighter days ahead. 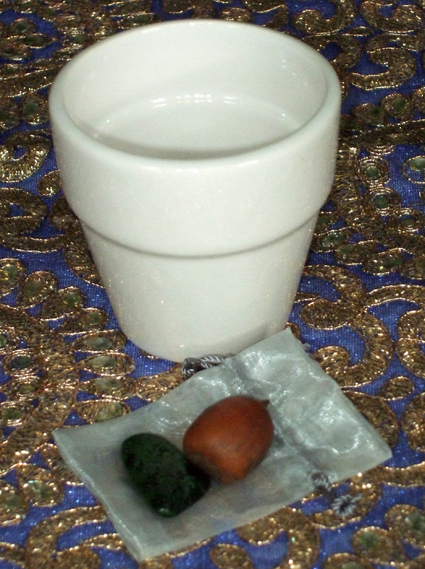 The kit provides most things, but you will need to add a few of your own – including the soil or compost to plant the acorn in, a charcoal block for the loose incense and some fruit juice as an offering. You might spot in the photo that a few items from the earlier Imbolc kit are also on the altar – the light-coloured altar cloth under the new one, the chalice for fruit juice and the pentacle. The candle holders, censer, small cauldron, salt bottle and water goblet in the picture are my own. 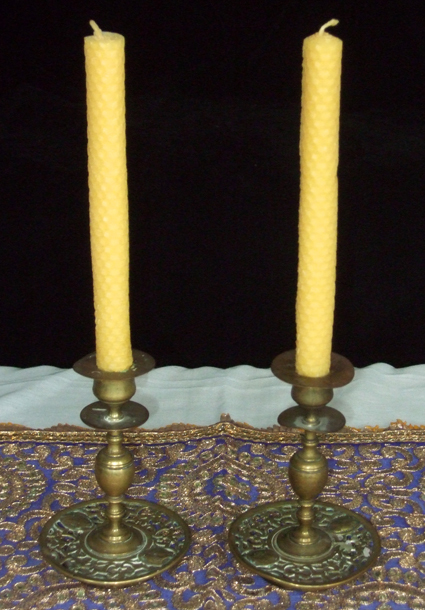 If you don’t have a proper censer for burning incense you can use any dish designed to withstand very high temperatures. If you don’t have a small cauldron, which the ritual suggests putting the compost in before potting the acorn, then I would say just put the compost straight into the flower pot. Or, of course, you could buy extra bits and pieces from Wicca Moon if you pop in there to get the kit! The people at Wicca Moon are really helpful, so if you have any questions about the kit or how to do the ritual, just ask them. Wicca Moon is at 50 Well Hall Road, Eltham, London, SE9 6SH. The website is http://www.wiccamoon.co.uk/.